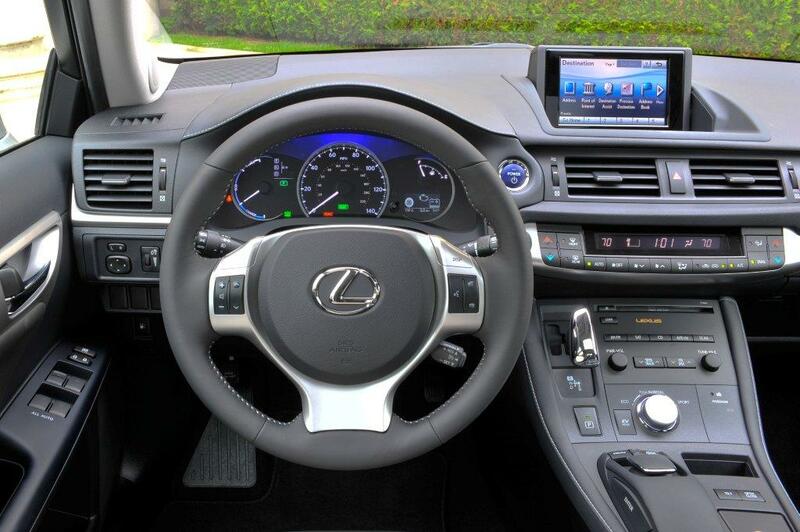 Smooth, efficient and oh, so very Lexus! There are the distinctive, blue accented Lexus badges front and back, as well as “hybrid” logos on the lower edges of the doors. Our verdict after a week’s driving experience? The CT200h is a hybrid that doesn’t look like one, yet fits right in. The surprises don’t stop with the exterior. Once inside, the driver and passengers feel more like being in a mid-sized sedan, thanks to its efficient design and layout. Just as luck would have it, the week before getting the CT200h I had a large, V8 powered SUV, and thus, going from that fuel-guzzling behemoth to the CT200h was definitely a major shift in size and attitude. At first, I felt a bit strange, yet with every mile driven, a transformation took place. This particular car seems to naturally makes you more focused on driving as smooth and efficient as possible, thus being rewarded with an overall average of over 45 MPG during the 400 miles that I drove this hybrid. It became a personal, badge of honor, so to speak, to boast about my high mileage in the CT200h. Way to go Lexus! There are three driving modes offered; “eco”, “normal” and “sport” plus the EV function that lets you drive on electric-only power for short distances. Going from normal to sport mode, there is a change in the left indicator in addition to the accent lighting associated with it. Soft blue for Normal mode, as well as an indicator showing if the vehicle is charging (regenerative or coasting), economy (steady cruise) or power (when being aggressive in accelerating). In the sport mode, the color changes to red and the indicator becomes a tachometer. This is a neat trick and one that’s fun to show off. Acceleration in the CT200h is adequate. Power is put to the front wheels via a CVT transmission, which takes a bit to get used to, as it does not shift between gears, like other conventional transmissions do. Once at highway speeds, the CT200h is impressively smooth and quiet, yes, it’s all Lexus. Braking feels strong and direct, with a side benefit of giving the propulsion batteries a boost via the regenerative charge system. One surprising feature of the CT200h is its handling, I was able to put it through its handling paces on my favorite expressway on-ramp and I was pleasantly surprised at the composure and balanced feedback the car gives. The leather-wrapped steering wheel has the typical array of controls, in addition to its wonderfully pleasant grip and girth. Seating is luxurious and surprisingly comfortable, with the rear seats offering nice comfort for two, but a bit tight for three adults. Cargo space is accessed through a rear hatch that offers a security cover, plus added space if needed simply by folding the 2nd row seating forward. All of the expected, typical luxury-level accoutrements are found in the CT200h, including a large, center mounted infotainment system that is managed by a mouse-like gimbal that takes a bit to get used to, but easy to use once adapted. One of my favorite features is the mirror-finished “T” shaped gear selector; this was definitely a nice idea that goes well with the technology and hybrid theme of the CT200h.